Cue the time machine: Long before smartphones, selfies, and our unquenchable online sharing culture, photos were the best mementos we had when returning from vacation. We shared prints with family and friends, pasted them in photo albums and loved showing off the fun we had during our travels. Universal Orlando’s “Show Us Your #UniversalMoments” campaign, with its tagline “Vacation like you mean it,” has captured this nostalgic sharing perfectly for our modern times. Their clever use of shared customer vacation memories offer marketing pros four user-generated content (UGC) tips to harness “universal” human behavior into marketing gold. Launched in April 2014, #UniversalMoments invited Universal Orlando visitors to upload their favorite photos and videos to Instagram, Twitter, Vine, or the Universal website accompanied by the hashtag “#UniversalMoments.” Since then, viewers have been sharing, downloading, and commenting, collectively building a vast catalog of UGC all about the fun times you can find at Universal Orlando. Universal Orlando shares customer content on its website and social channels, including Instagram, Twitter and YouTube. And, many customer images were even used in a recent Universal Orlando TV commercial. This UGC campaign works because it taps into basic “universal” human behavior. People love to show and tell vacay photos, especially the photos that capture the essence of the vacation, or the ones where we look our best, goofiest, or relaxed. #UniversalMoments allows visitors to pick the perfect photo and memory and share it with the world —hanging out with Scooby Doo characters to enjoying time with the family and riding roller coasters. True fans love seeing their photos on the website, and imagine the heightened excitement for those who had photos selected for the TV commercial. Universal doesn’t just post all the images on its site; it filters them into categories: excite, relax, play, connect, or thrills. This helps future customers hone in on what they want from their vacation and envision themselves at the park. As a bonus, these “vacation verbs” might inspire visitors to participate in other activities while at the park. By connecting with emotions of the customer they create a deeper desire to take action (book the trip)! We know people share their favorite images on social media, both while traveling and when they arrive at home. Through this campaign, Universal encourages their customers to tag those very photos with a simple hashtag, with the potential to be featured online. When someone’s images are showcased on Universal’s website, they are likely to share the campaign itself. When we share our photos with friends, they enjoy it because they know us, they like us, and they are happy to see us happy. To our friends, we are real people, not just another model on location at a photo shoot in Florida. UGC used in this campaign manages to instill the same feeling. The photos that are submitted by customers are not professional shots; the people have not been cycled through hair, make-up and wardrobe, and they look like, well, real people. Real people bring authenticity to any marketing campaign. 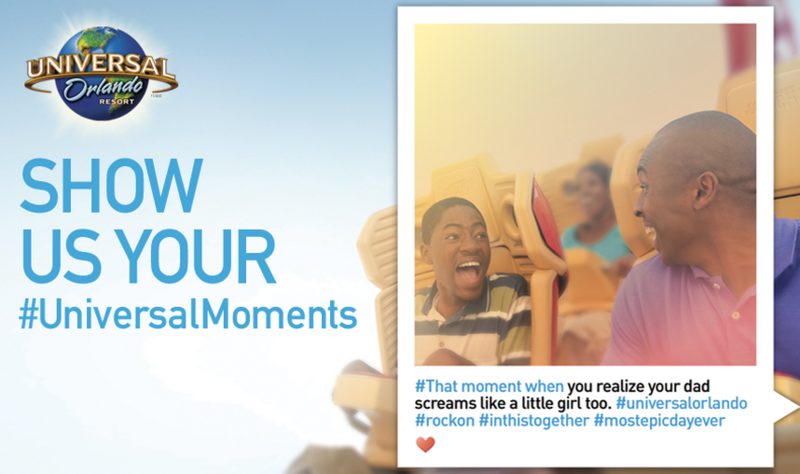 Ultimately, what makes the #UniversalMoments campaign work is that customers become engaged through memories. Everyone wins; those creating the moments captured in the images, the people sharing them with others, those who are planning their next vacation and Universal itself. Contributor Bio: Janice Cuban is a communications consultant based in San Francisco, Ca. She helps B2B, B2C, and small businesses find their inner content voice and shout it to the world (or at least to their target markets). Janice is also a blogger, freelance writer, and lover of all things marketing, technology, and trends. Find her on Twitter, LinkedIn, and at janicecuban.com.